This maintenance free unit that helps protect your home and family from excess moisture, molds, toxins, allergies and poor air quality resulting in a cleaner, healthier living environment. It provides powerful ventilation, supporting both the EPA and the American Lung Associations' recommendations to use a ventilated system to reduce indoor air pollution. The EZ Breathe® unit itself is a quiet, unobtrusive apparatus that fits easily into any room in the house. With no water or filters to change, it requires no on-going time or attention. With its energy efficient design, it requires very little power and no on-going investment. It is a truly revolutionary approach to home ventilation. 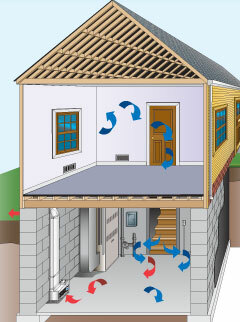 The EZ Breathe® expels the dampest, coldest most contaminated air from your home to the outside. The most common question asked by homeowners is: "If the air is exhausted outside, do we lose any heat?" The answer is no. Since EZ Breathe® eliminates only the damp, cold, air at the lowest level of your home, the potential for losing heat is low. Damp basement air is harder to heat than dry air, so it's more economical to replace damp air in your home and heat fresh dry air. Once the EZ Breathe® unit has exhausted the damp air outside and replaces it with dry air from the higher levels of your house, it will shut off. The EZ Breathe® continuously monitors the humidity levels, turning itself on as humidity levels increase. This component continuously monitors the humidity level of the air being expelled through the EZ Breathe® unit. You can set this control to maintain the desired level of humidity in your home/building. For best results, set the humidstat between 30 - 50%. NOTE - when the desired humidity level has been achieved, the EZ Breathe® unit will automatically turn off, or back on again as the humidity level increases. The EZ Breathe® will run continuously until desired level has been reached. Don't worry; the unit has been designed to perform under these conditions. During winter / colder periods when the furnace is often running, the unit may shut off due to the humidistat reaching the desired humidity level. During these periods, you can set the humidistat to its lowest setting and turn the fan to low. This will cause the unit to run on low continuously, providing ventilation for the space without exhausting heated air. The rate at which you expel the air outside is adjustable with the help of this control. In the summer, set the speed control on med - high. In the winter, set the speed control to med - low. VENTILATION ONLY: Humidistat to 20% & Fan Speed to slow. Excess moisture in a home can weaken a home's structure, damage personal belongings, cause unpleasant odors and reduce air quality. A high level of moisture can cause mold growth which can lead to bacteria, cockroaches and dust mites. This excess moisture can also cause the rotting of a home's foundation and be the origin of asthma and allergies in the home's inhabitants. Moisture can originate from a number of outdoor sources as well as from the activities of those living in the home. Odors: higher humidity leads to the increase in indoor smells. Musty odors can be caused by mold, mildew and rot. It is important to diagnose excess moisture problems early to prevent further damage. The EZ Breathe ventilation system can help reduce the level of indoor moisture by removing damp, contaminated air. The result is drier, cleaner and healthier air that will reduce the risk of home damage and health issues. Odors and smells within a home not only cause discomfort but can also be the result of bigger problems such as excessive moisture in the air and mold. Mold in a home can cause headaches, nasal irritation, dizziness, fatigue and nausea. The main culprit of lingering, unpleasant odors in a home is the lack of proper ventilation and poor air quality. 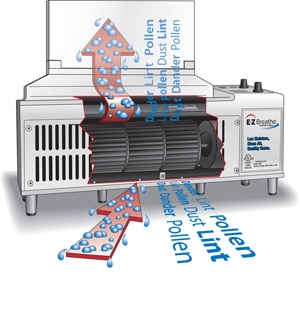 The EZ Breathe® ventilation system can take care of all ventilation issues including air purification and odor removal. This system removes harmful contaminants that cause odors and replaces the home with fresh, odor-free air. You will notice a big difference immediately!